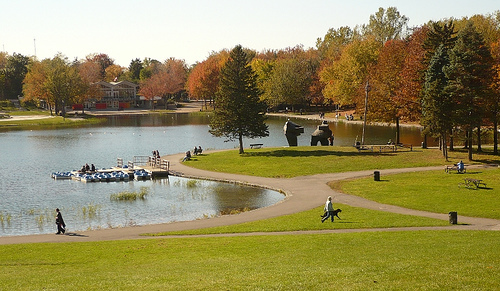 Olmsted-designed Mount Royal is a beautiful park in the heart of the city. Wide, well-marked, wooded trails criss-cross the mountain, switchbacking their way to the summit. The highlights of running Mount Royal are up to the 700-foot summit (“Croix”), the entire “up and over”, and a the thigh-burning Olmsted Stairs. Take in Beaver Lake, and grab a coffee or a snack at the lovely snack bar and changing area. In winter, the trails on Mount Royal are used for cross country skiing, and there’s a small downhill skiing and renowned sledding area. Beaver Lake is a popular skating spot – romantic at night! Run to the “Croix”. 3.7 miles RT. Numerous points of access. A good place to start is on off Ave. Des Pins. at the Olmsted Stairs. Downtown access from Peel Ave — straight up Peel to Ave Des Pins. Follow “Chemin Olmstead”, which switch backs you around the mountain, by Beaver Lake, the Cross, and to the Summit. It is a good climb, about 400 feet. The “Full Mount Royal”. There are numerous additional paths within the park. It is possible to add 3–4 miles from the above run, using mainly Chemin Olmsted, the main yellow line in the map below, to the Cartier monument in Parc Jean-Mance. Access: Good access from downtown: Ave. Des Pins. at the Olmsted Stairs; Even easier access is at Ave. de Musee and Ave. Dr. Penfield, there are some stairs there. Winter Running: there are enough folks on the trails that the snow on popular ones gets packed, so running is possible. Caution and Yak-Traks advised!